UK Release Date - 4th October 1993. US Release Date - 5th October 1993. Album Type - Compilation/B Sides. Producer - Def Leppard/Pete Woodroffe. Backing Vocals - Robert John "Mutt" Lange (multiple songs)/P.J. Smith (Action). String Arrangement - Michael Kamen (Two Steps Behind). Guest - Ian Hunter (Honky Tonk Messiah on Ride Into The Sun). Guest - Pete Woodroffe (Piano on Miss You In A Heartbeat). Guests - Hothouse Flowers: Fiachna-tin whistle/Liam-grand piano/Peter-mandolin (From The Inside). Studio - Rainbow Studios/Olympiahalle, Munich, Germany. Studio - Bow Lane/Joe's Garage, Dublin, Ireland. Special Formats - French Limited Edition 2CD card sleeve. CD2 has six Adrenalize-era B-Sides (5 live/1 demo). The first compilation/B Sides album released by the band. The album was intended to 'tie up' the Steve Clark era of the band before the first studio album with Vivian Campbell. Vivian contributed to some of the songs with guitar overdubs, vibraphone and background vocals. It featured finished off old songs and re-recorded/re-worked versions of previously released B-Sides from Hysteria/Adrenalize. Various alternate versions were included with a bonus third version of 'Miss You In A Heartbeat' at the end. Joe's idol Ian Hunter guested on a new piano intro to 'Ride Into The Sun'. Other guests included P.J. Smith on backing vocals and three members of the Hothouse Flowers. "This is not a new Def Leppard album - nor is it an old Def Leppard record. It is "Retro-Active", a collection of songs that have appeared in hard to find places or, in certain cases, never made it out of the studio until now." 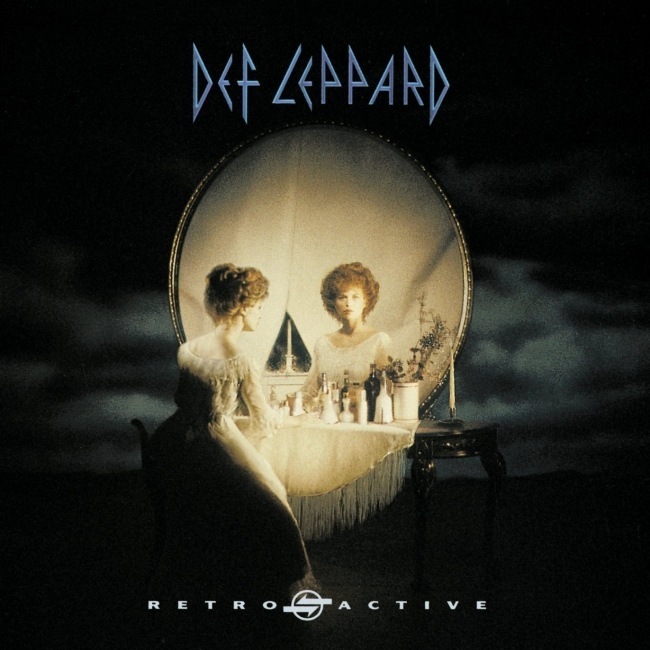 "Retro-Active" was compiled from songs recorded over a nine year period and features three versions of Def Leppard: with Phil and Steve on guitars, with Phil alone, and with the current Phil/Vivian axis." "This album is a collection of rarities, B-sides, and unreleased material." "Includes Two Steps Behind - as featured in the Columbia Motion Picture "Last Action Hero".